Readers of our reviews may recognize this author and series from Daisy's review from not too long ago of the second of Rothfuss's novels. She gave the second book, A Wise Man's Fear, a glowing review. When I glanced at the blog that day I thought, "Ah! Can't read this!! Must divert eyes!" as I was about 3/4 of the way through the tome of a first novel. I thought about it for awhile and decided I still wanted to review the first book. First, I don't read fantasy often. It is not normally my genre of choice. Second, I don't normally gravitate toward books over 450 pages. This hits both of those. So I went in pretty apprehensively. This is the story of Kvothe. Kvothe is telling his story, I guess is a more accurate statement. He's been through a whole bunch of interesting things, but this first novel focuses on his early life with his traveling troupe and his days at school. Honestly though, the plot is not what I want to talk about. I mean its good and flows well, but the real star is the writing. The prose is just brilliant. I am most likely going to read it again just so I can really soak in the brilliance of the words used. There are so many quotes I wanted to write down, but I didn't want to stop reading! "Hauntingly beautiful" was the words I jotted down after I finished. The characters are very three dimensional, even the secondary characters. Kvothe is a very relatable and likable hero, which I think is pretty essential in an epic story. The evil guys, the Chandrian, are super mysterious and I would keep reading if only to find out more about them. While first person is normally a con for me, this was done well. I really liked how it was treated as a narrative and will really hold the series together well. We have the advantage of the past with Kvothe as most of the story is told through him telling the story to someone else. I think the POV here is what helps make the composition so effective. My only con is one I see a lot in the fantasy novels I've read (and like I said there are not a lot, but even though I have not read too many but my opinion still stands). The con is that there is not a defined enough climax for me. It just seemed like… well stopping. I can see how it fits in with the story, but when I didn’t get that "Ah I just finished a book" feeling, I was left disappointed. This is my favorite book, for all the reasons you said - the characters, the mysteriousness...and above all, the writing. It is so gorgeous, when I recently read Wise Man's Fear I stopped like every 3 seconds to add a quote to Goodreads! great review, so glad you stepped out of your comfort zone and enjoyed it! I've been waiting for this book for years, ever since I finished Name of the Wind! I keep hearing great things about this series. Thanks for another great review and recommendation! Loved this review...will definately check these books out. Thanks!!! I really liked this one as well. My only complaint was that I thought it was too mushy romantic in parts. I'm just about to get the second one after being on hold at the library. I've been in line for the second one forever! I dont want the book though; I want the ebook. Lugging The Name of the Wind around airports was horrid! I am glad everyone likes this review! For me it was hard to believe how good this book is until I actually read it. So yay! I love these books. Patrick Rothfuss is a genius. Awesome review btw. And I love that last quote. That would've been a good "aww" moment for this week's TTT! One of my all time favorite books. There were several passages that literally brought tears to my eyes or made me catch my breath. Agreed on the lack of climax. 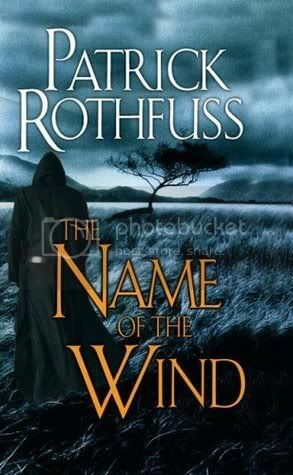 I am a little afraid of all that Rothfuss has to accomplish/explain in the third and final book. My boyfriend is all over me to read this book. Guess I'll have to give it a shot!